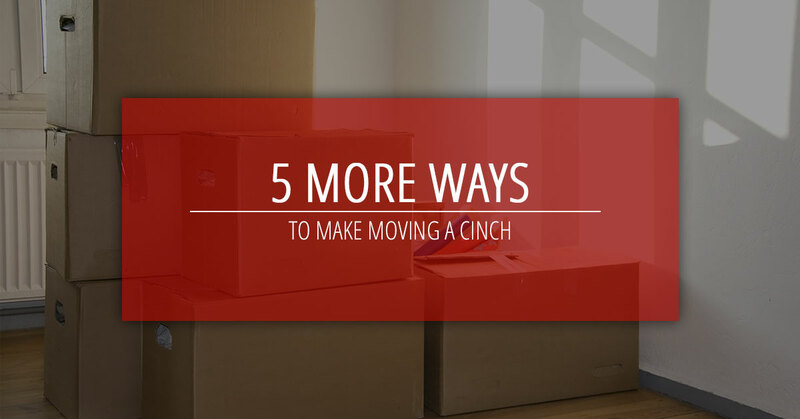 Last week we introduced you to five simple steps you can take to make moving a cinch. This week we’ve compiled five more tips to ensure you look forward to your move instead of stressing about it! 6. Decide on and arrange your moving transportation. Be realistic when you start making plans for the type of transportation you are going to use on moving day—if you have a lot of bigger furniture pieces, are you really going to be able to fit them into the back of a pickup truck, or are you going to need something more spacious like a moving truck? If your move is only across town, you may be able to get away with packing your boxes into a few cars and using a utility trailer for larger items. If you are moving to another city or state, it would be in your best interest to rent a moving truck so that you can have all of your packed belongings in the truck while your family has plenty of space to spread out and enjoy the ride in your car. Moving trucks are not very expensive, and if you are budgeting your moving expenses, this is definitely an investment for which you should set funds aside. If you have boxes with extremely valuable or fragile belongings, you may want to keep those with you in your family car while you travel, just to be safe. 7. Enlist the help of your family and close friends. First things first–remember that if you recruit your family and friends to help you move, you are going to be their first call when it comes time for them to move! Just a friendly reminder! That being said, a calling in a squad of trusty helpers is an awesome way to speed right through your move. The more hands the better! Plus doing things (yes, even moving boxes) with the people you love is always a good time. Who better to laugh with than your best friend when you drop the vase full of decorative stones and it shatters in the hallway. Family and friends will offer both physical and emotional support while you move. “Repay” them by providing food, snacks and beverages. A bag of potato chips and a cold soda go a long way during the hot summer days! Don’t make the mistake of arranging your moving plans to accommodate friends or family, though. If you are all set to move on Thursday at six in the morning but your brother and cousins aren’t available until Friday at noon, don’t change your plans! Changing the plans you have already created is guaranteed way to cause unnecessary stress and chaos. You have already come up with the perfect game plan, so stick with it. Also consider the fact that life happens, and schedules change. What happens if you rearrange your moving plans to accommodate your brother’s availability, and come moving day, he is no longer available to help? Enlist the help of family and friends, but don’t create your plans based on their availability. 8. Unpack your bedsheets and make your bed before you unpack anything else. At the end of a long and draining day of moving, all you are going to want to do is take a hot shower and fall into bed. When you get to your new home and are ready to unpack, find your bedsheets and make your bed. This way, when you are ready to crash at the end of the night, you will be able to climb directly into bed without delay—a well-deserved treat at the end of a big, eventful day! Pack your family’s bedding in its own box so that it is easily and readily accessible when you are ready to make your beds. 9. Try to make moving fun! Turn your moving day into a moving party. Put together a playlist of awesome upbeat jams that you can listen to while you’re packing up the car. And no moving party is complete without the proper snacks and beverages—order a pizza and keep a stash of cold water bottles nearby! Make sure to stay hydrated during the day, especially if you are moving in 100+ degree weather. These simple additions will help boost your mood and attitude while you are packing. The day will be much less stressful and time will fly while you are having time. Pro tip: make sure you have a bottle of champagne or sparkling cider ready to pop as a celebration of your efforts and accomplishments. Congratulations on a successful move into your new home! 10. Call the professional realtors at Schreiner Realty. If you have recently enlisted our professional services to help you buy or sell a home in Gilbert, Chandler, Mesa or Tempe, we thank you for your business and hope you enjoyed your experience with our team of professional real estate agents. If you have yet to get in contact with our team, give us a call today. We have extensive knowledge regarding all things real estate and can provide you with all the information about the city and neighborhood you are moving to. At Schreiner Realty, your happiness is our priority. If at any point you have questions or are in need some helpful tips, we are here for you. So, if you are ready to buy or sell a home and are looking to work with the most professional and experienced realtors serving Gilbert, Chandler, Mesa and Tempe, get in touch with our team today!